It's been basically forever since I posted a pattern. Part of that is because I've been busy, part of it is because photography is not my strong point. In terms of skill, I've got nothing and in terms of equipment, all I have is a crappy phone camera. But nonetheless, I still wanted to share one of (there are more coming) of my latest projects: The Bubblegum Hat. Because of the math involved, the Bubblegum Hat currently only comes in one size-- woman's medium/large. If you're interested in more sizes, let me know. I'd be happy to make a few more sizes. See what I mean by crappy photography? Ugh, and the seam's facing out. Oh well. I've spent too many hours fighting photos and editing and slow internet. This pattern is free for you to use but not for me to make. Please pay it forward by sharing it on social media and checking out Stuck with Ewe's Facebook page. Or check it out on Ravelry and Pinterest. First three rounds measure 3.25 inches across. 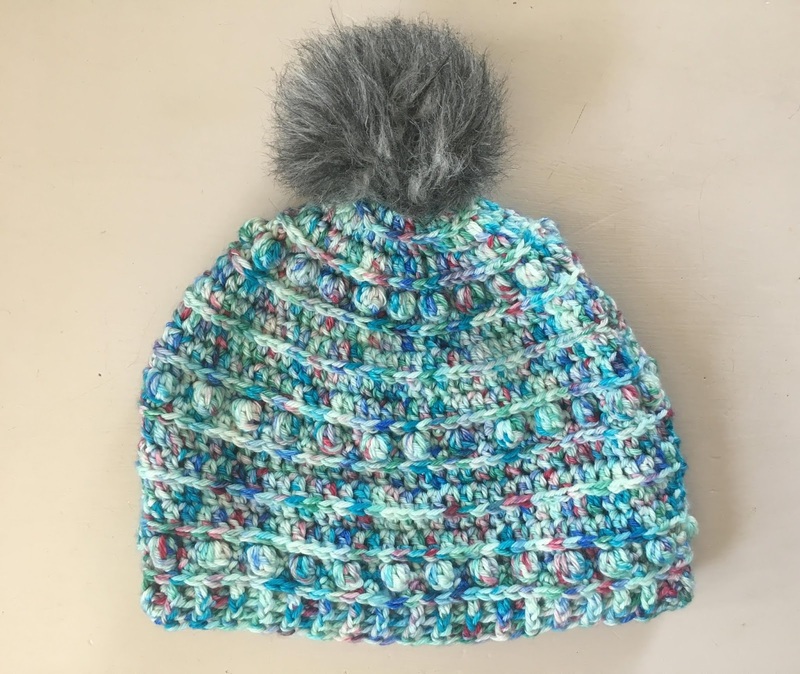 This hat is sized to fit a 22-23" head. 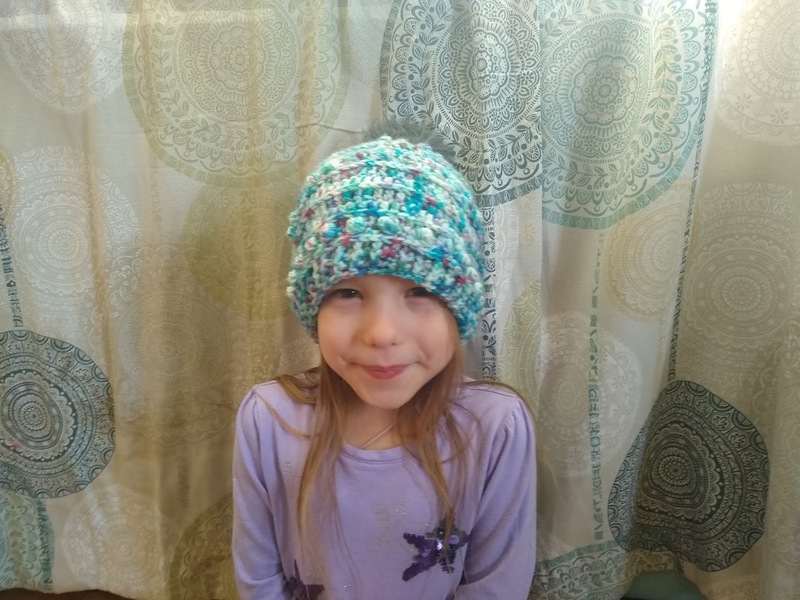 (A women's medium/large) Because I have an unusually large head, I added a few extra increases to mine that are not included in the pattern. A ch at the beginning of a round never counts as a st.
A sl st at the end of a round never counts as a st. Working in the third loop: Work the whole round in the third loop. Instead of working in the front or back loop of a dc or hdc, work in the third loop behind the top of the st. Moogly explains it well HERE. Bob (bobble): *Yo, insert hook into st, pull up a loop, yo and pull through 2 loops* 4x, yo and pull through all 5 loops. One bobble made. 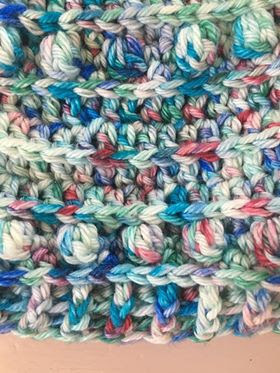 FPdc (Front Post Double Crochet): Yo, insert Hook from front to back around st, pull up a loop, *yo and pull through 2 loops* 2x. Once front post dc made. 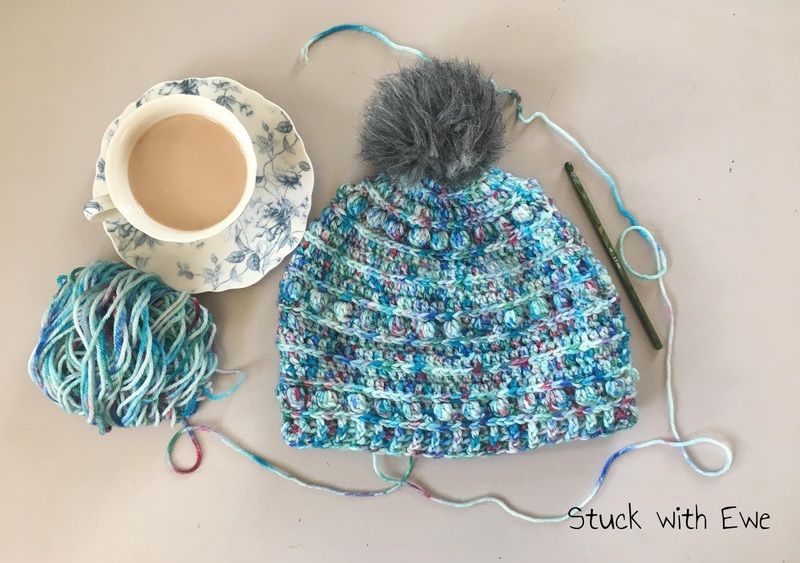 BPdc (Back Post Double Crochet): Yo, insert Hook from back to front around st, pull up a loop, *yo and pull through 2 loops* 2x. Once back post dc made. Round 11: Repeat Round 9. Round 15: Repeat Round 10. Round 16: Repeat Round 9. Rounds 17-23: Repeat rounds 10-15 once more. Or repeat rounds 10-16 (ending on a Round 15) until hat is roughly an inch from desired length/slouch. Fasten off and weave in all ends. 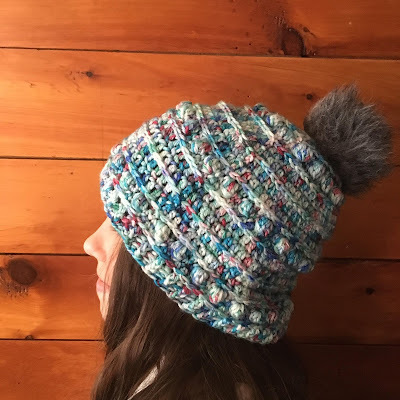 If desired, attach a fur pompom to the top and rock your awesome new hat! Copyright 2018. Do not reproduce this pattern in whole or in part. To share this pattern, link back to this page. 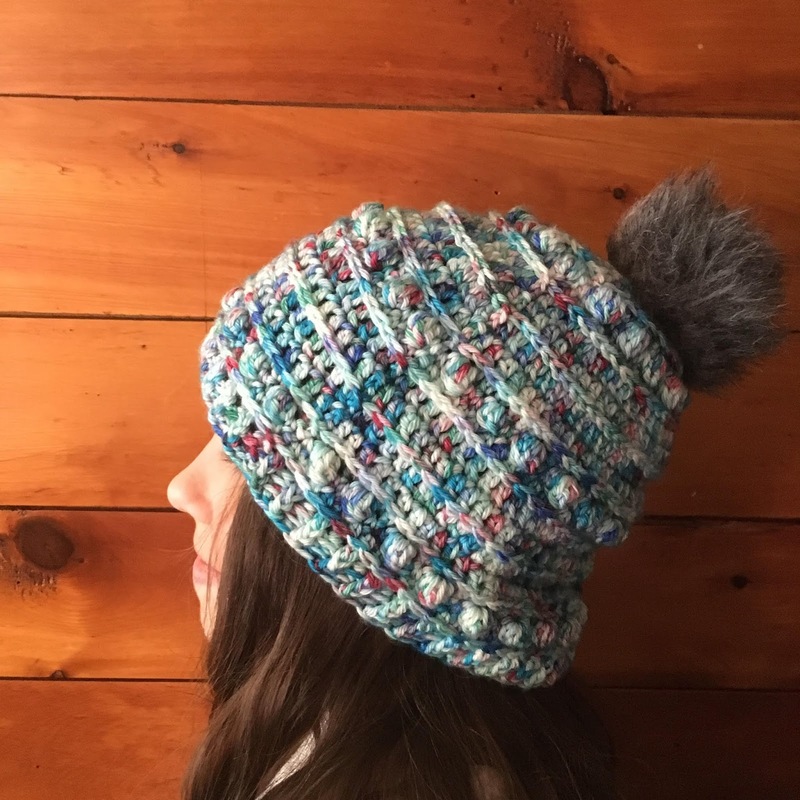 You may sell items you make with this pattern but I ask that you credit me as the designer. I work hard to develop my patterns and I ask that you respect that.